Veni Vidi Vista (3VS) is a creative agency located on Lakeside Circle in Sterling Heights. We offer amazing turn-key website plans. What’s amazing about our websites? Great question. Custom design, based on your business branding and style. No templates! New Web Design every 4 years! A Web 1.0 Website is a “Read-only website,“ which means that you will not have a login and cannot edit the website yourself. Thankfully, this monthly plan includes content updates. Your website deserves a great Domain name. A Domain name is one component of a website trifecta: the others being Hosting, Design & Development. This domain name is optional. We can use a domain that you already own. Your website will be built on only 1 domain name. All the text, graphics and images for your website have to physically sit somewhere so that internet browsers can populate and display your website. This is what hosting provides. Think of it as a hard drive located in “the cloud.“ Hosting is included in our monthly website subscriptions. 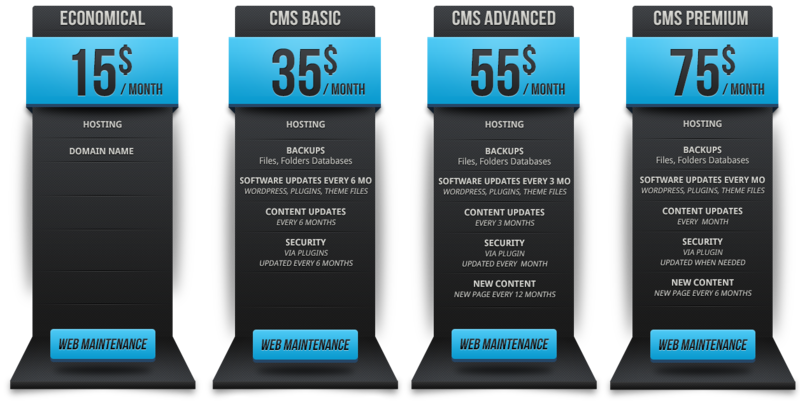 Monthly website subscriptions require the use of our server hosting. Things change. Phone numbers, addresses, events, promotions. Your website needs to reflect these changes. Our monthly subscriptions include updates. Responsive means the content of your website is scaled & adjusted to be displayed optimally based on the screen size it’s being displayed on. Image sliders (also known as image carousels or slideshows) can be a great way to display multiple images, videos, or graphics on your website. The thought of big, beautiful, flashy image shows can be quite alluring. Compelling images can draw new visitors into your site, capturing their attention immediately. Basic informational contact form (name, phone, email message). No advanced features like file uploads, conditional logic, no CAPTCHA, etc. All images and graphics will be used from our huge royalty free library. Requested or unique, niche images and/or graphics that are not available currently in our library are available for additional costs. Receive a new web page every 12 months as long as you remain on on a monthly website plan. Web technology moves extremely fast. Receive a new site design & development every 5 years to ensure you’re ahead of the times and your competitors. Your pages can be anything you want, including a biography or about us page, a history page, a product or service page or specific city pages for SEO. Portfolio pages are limited to a total of 15 photos. Web technology moves extremely fast. Receive a new site design & development every 4 years to ensure you’re ahead of the times and your competitors. Your pages can be anything you want, including a biography or about us page, a history page, a product or service page or specific city pages for SEO. Portfolio pages are limited to a total of 25 photos. We are notified immediately if your website does down. A Web 2.0 Website is a “dynamic website“ meaning that you have a login and can edit the content yourself. Web 2.0 websites are much more complicated and consist of a MySQL Database in addition to your website files & folders. These websites MUST be updated and maintained. Just like your smart phone and its apps require updates, so does your website, its apps and plugins. Our monthly subscriptions include updates. Your pages can be anything you want, including a biography or about us page, a history page, a product or service page or specific city pages for SEO. Portfolio pages are limited to a total of 35 photos. Advanced custom forms are custom designed for you needs. CAPTCHA, Signature Pad, Conditional Logic, File uploads, calculation and more! All images, graphics, videos and animations will be custom created and/or used from our huge royalty free library. Requested, unique or niche images and/or graphics and/or video that are not available currently in our library are available for additional costs. Web technology moves extremely fast. Receive a new site design & development every 3 years to ensure you’re ahead of the times and your competitors. Your pages can be anything you want, including a biography or about us page, a history page, a product or service page or specific city pages for SEO. Portfolio pages are limited to a total of 45 photos.